European oven designers and manufacturers are among the most progressive in the world. Appliance innovations have always originated from first-hand experience, and the uniquely Scandinavian ASKO brand provides a bridge between traditional oven capabilities and modern oven innovations. Form and function remain at the forefront of ASKO development, resulting in versatility that only the best technology can provide. The ASKO ODV8128G Vacuum Drawer is an ASKO success story, introducing home chefs to cooking mediums previously only experienced in the best high-end restaurants. The ASKO ODV8128G Vacuum Drawer is only 14cm high; around the same height as a regular kitchen drawer. In other words, the vacuum drawer can rest seamlessly below a built-in ASKO wall oven, creating incredible culinary reach and versatility. In tandem with an ASKO Combi Steam Oven, the ODV8128G provides the opportunity to satisfy everyone, regardless of meal preferences or dietary restrictions. Vacuum drawers are the secret behind sous-vide cooking, a healthy eating alternative gaining followers around the world. What are some vacuum drawer uses? Vacuum-packing extends the lifetime of food while also locking in nutrients. Food prepared in an ASKO Combi Steam Oven can be vacuum sealed at the perfect level of tenderness. During vacuuming, all air is removed from the bag, halting any microbial action and allowing food to be safely stored many hours prior to serving. Restaurant quality sous-vide meal inspiration is another way to use the ASKO ODV8128G Vacuum Drawer. Simply divide food into vacuumed portions, and prepare using steam to slowly tenderise and cook the meal. Nutrients are locked in and fatty oils and unhealthy additives are avoided, providing the opportunity to stick to any health or fitness regimen. 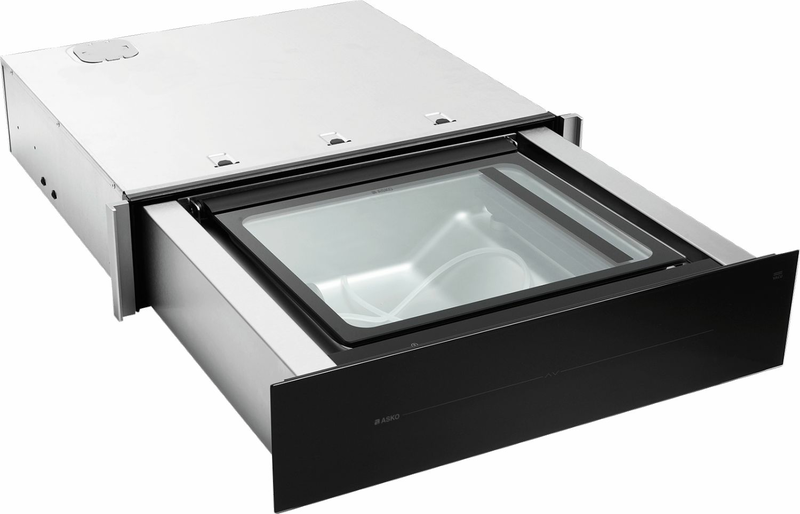 Why choose the ODV8128G Vacuum Drawer? When using a regular oven, the food being prepared is carefully monitored to avoid undercooking, overcooking, or burning. This is because the operating temperature of the oven needs to be high enough to cook the food within a specific time-frame. When cooking sous-vide style, the food is heated at it’s ideal cooked temperature, meaning it won’t burn, overheat, or lose nutritional quality. As the cooking is performed at low temperatures for a longer duration, typical cooking hazards of burning, boiling or overflowing are avoided. It’s quite common these days for home cooks to prepare and store meals ahead of schedule. While the intention is good, the results aren’t always so impressive. If not stored properly, food will spoil, spill, smell and ultimately be discarded. Vacuum sealed food, on the other hand, takes up little room during storage, is ready in minutes, isn’t tainted by other foods, and can be conveniently divided into meal sized portions. With a little training, even the most reluctant family member will appreciate the convenience of instant home-cooked meals and treats. Leading a healthy lifestyle and looking good is no longer optional in some circles. Australian homes have benefitted greatly by the introduction of food products from around the world, and when prepared using quality ASKO appliances and innovations, meals are again becoming focal family time that everyone can participate in. It’s only fair that people are given the opportunity to explore healthy eating options, and ASKO developers ensure every meal choice is available for personalised eating pleasure.